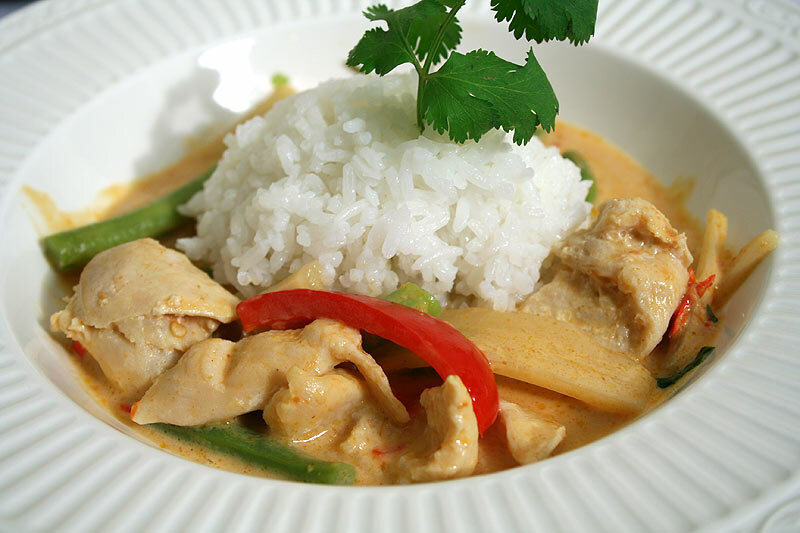 If you love the fiery taste of thailand, this is a must to try recipe. Red curry paste is available in most thai/south asian grocery stores. Heat sauce pan over medium heat. Add coconut cream (thick part that floats on top of the can), red curry paste, and peanut butter; blend them well with stirring for 3-4 minutes. Add chicken breast and egg plants, cook about 4-5 minutes until chicken and eggplants are almost done. Then add bamboo shoot, red chill, fish sauce, sugar, and kaffir lime leaves. Cook about 2-3 minutes remove from the stove and place on serving dish. Serve with sweet rice or regular rice. How many eggplants ?? cut or whole? pls explain.